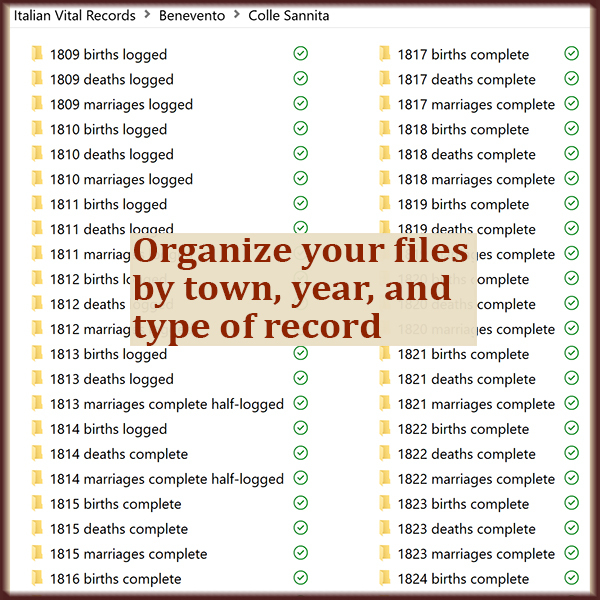 You've downloaded thousands of vital records from your ancestor's birthplace. How do you find your people in all those files? My genealogy research changed dramatically in 2017. I decided to put my U.S.-based research on hold. Why? Because a new door opened wide. Now I have access to my ancestors' birth, marriage and death records in the old country. And I will discover many more. 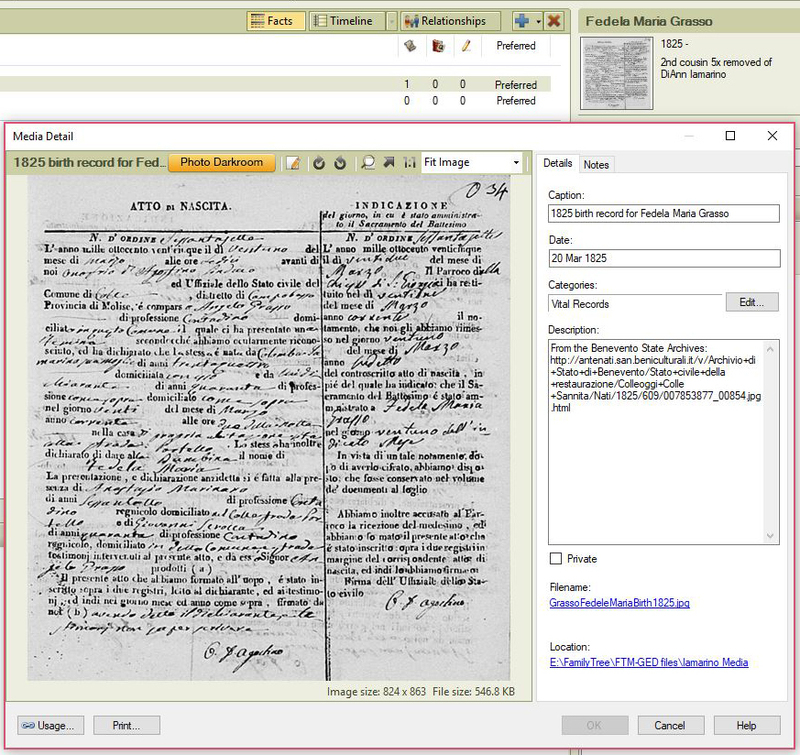 A brief explanation: FamilySearch.org ended their microfilm program. They used to send rolls of microfilm to your local Family History Center. You could visit these rolls during your center's limited hours and view them on antiquated machines. But in 2017 they began digitizing everything. Earlier, I spent 5 years viewing microfilmed vital records from my grandfather's hometown. I typed all the important facts into a laptop. 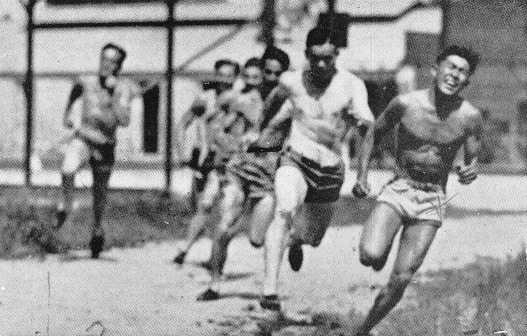 Suddenly those thousands of records are available as high-resolution images online. Free! And so are records from the towns of all my ancestors. You can find them on FamilySearch and on an Italian website called Antenati (ancestors). I started viewing images from my grandfather Iamarino's town and downloading them. One by one. It was going to take forever! Then I learned about a simple program called GetLinks. This program runs on any type of computer. It's compatible with FamilySearch and Antenati. 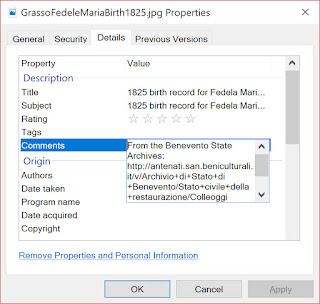 For a full explanation and a link to the program, see How to Use the Online Italian Genealogy Archives. Now I have well-organized image files from all my ancestors' hometowns. They range in time from 1809 to as late as 1942. But they include rewritten documents of births and deaths from the 1700s. That's how I've found such early ancestors. Simplify your search by organizing your downloads. I'm limited to documents written as early as 1809 only because it's Italy. If your ancestors are from other countries, you may find much older records on FamilySearch.org. So let's say you've downloaded thousands of images containing oh-so-many of your ancestors. How do you find your people? How can you efficiently pull out the people and facts you need? What's the best way to find your needles in those haystacks? I'm approaching my 8 haystacks (individual Italian towns) in 3 different ways. You might choose one or two, or want to do them all. I'm typing the facts from each document into a spreadsheet. In the end, I'll have an easily searchable file. Want to locate every child born to a particular couple? No problem. Want to find out when a particular 4th great grandparent died? No problem. But it is slow-going. I've completed about 6 years' worth of birth, marriage and death records for one town. I return to this project when I'm feeling burned out on a particular ancestor search and want a more robotic task to do. There is another benefit to this method. Spending this much time with the documents has made me very familiar with the names in my ancestors' towns. I can recognize names despite the awful handwriting. And when a name is completely unfamiliar, I often discover that the person came from another town. A well-organized spreadsheet is best for making records searchable. Whenever I find a particular record, I like to edit the name of the image file to include the name on the document. 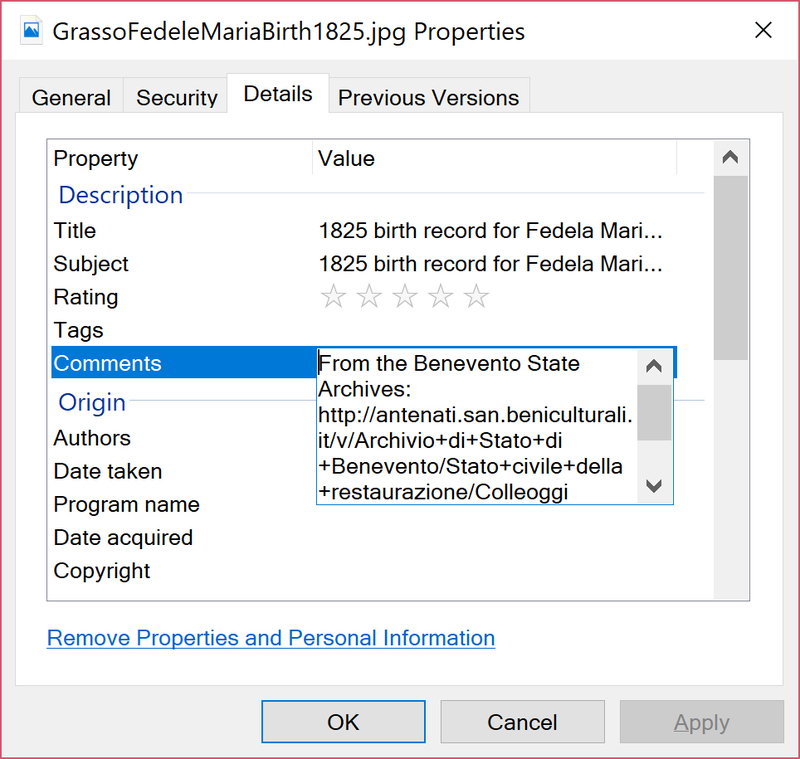 If it's an image of a single birth record, I add the baby's name to the end of the file name. If the name is common, I also add the baby's father's name. (I use the Italian word "di" as a shorthand for "son of" or "daughter of".) If it's an image of 2 birth records or a marriage record, I'll add both names to the file name. The benefit of renaming the files comes later. When you're making another search in the future, the renamed file can save you time. You can either spot the name you're looking for, or use the search box in that file folder. 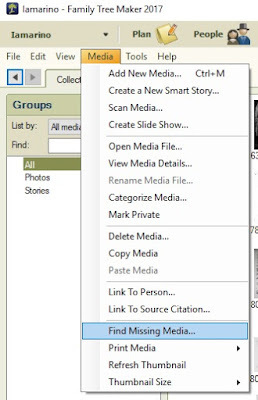 You can even use the search box at a higher folder level. Imagine you're looking for my grandfather's name, Pietro Iamarino. You can search his entire town at once and let your computer find every file you've renamed to include "Pietro Iamarino". When I began downloading the files, I renamed each file containing anyone named Iamarino. Now I can always find the Iamarino I want. Quickly. 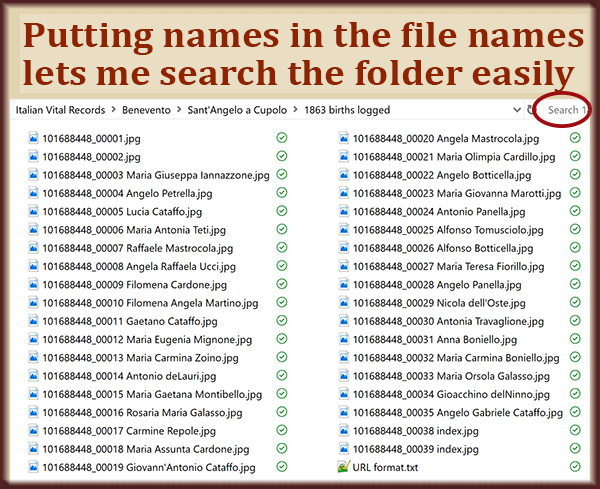 Adding people's names to the file names makes the collection searchable. To my mind, this is the most important lesson. 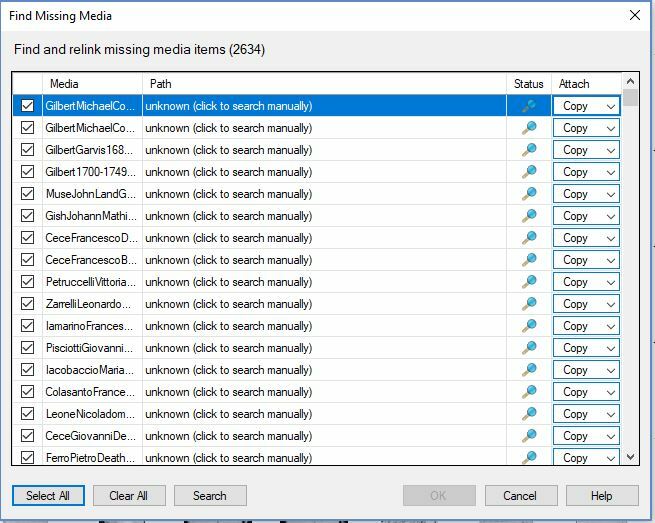 You'll be more efficient at finding what you need in this massive amount of files if you put blinders on. Search with a tight focus. Ignore the people in the index with your last name. You'll get back to them. But at this moment, when you're searching for someone in particular, don't look at anyone else. Zero in on that one name and complete your search. Use this focused approach and find your ancestors faster. The moment you find them, rename the file and get that person into your tree. My many folders of vital records hold countless discoveries for me. But I've found that choosing one family unit and searching only for them is highly effective. Here's an example. I've found the birth record of a particular 2nd great grandparent. I know their parents' names (my 3rd great grandparents), but I don't know when they married or their exact ages. I'll search the surrounding years for more babies born to this couple. Now I'm putting together their family. I'm also trying to identify which is the eldest child. Now I can search a year before the eldest child's birth for the couples' marriage. There I can find their ages, and possibly see a rewritten copy of their birth records. With that set of marriage records and my 3rd great grandparents' birth records, I've now discovered the names of 2 sets of my 4th great grandparents. And if they weren't born too early, I may be able to find their birth records, too! Having built out one family unit as far as I can, I'm even more eager to pick a new family to investigate. Sometimes I'll choose a family with a dead end, and work to find that missing piece of the puzzle. Which method will work best for you? Or will you combine all 3 as I'm doing? Your family tree is not reliable without sources. Don't let creating sources intimidate you. When you started your genealogy research, were you noting the source of each and every fact? Or were you so happy to find grandma in the 1920 census that you rushed off to find her in the 1930 census? No one is going to trust your family tree if it has no sources. If you're ignoring your sources because it's too complicated or you don't know where to begin, let's make it easy. 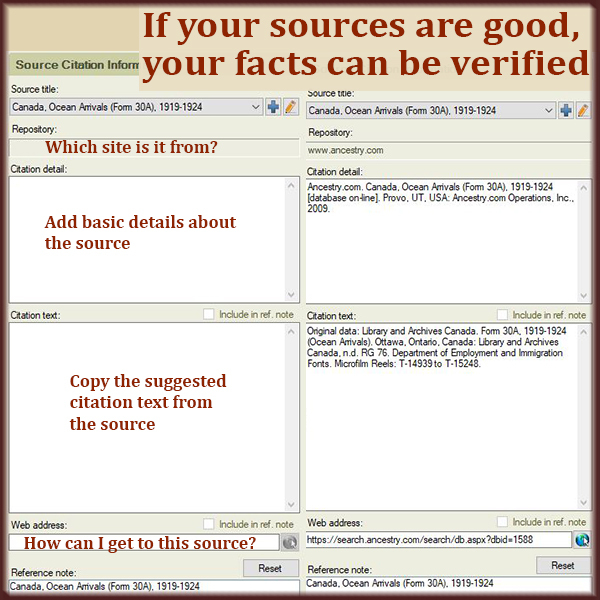 Here's how you can easily create your general source citations and specific image and fact notations. Can't find grandma in the 1920 census again? Aha! That's the main reason you must make note of your sources. Try to find an easy one to start with. If your source is a national census, a passport application, or a passenger list, it's part of an official document collection. 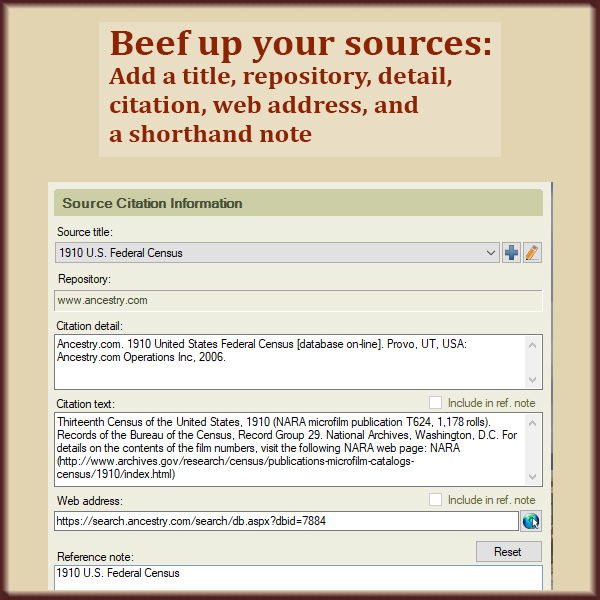 Put the exact title of the document collection in your source citation. I like to use the same title as my reference note in Family Tree Maker because it's nice and short, easy to understand, and doesn't take up a lot of room. Think of this as the address where the document collection lives. It may be ancestry.com, the New York State Library or familysearch.org. Write down the basic URL or building name. Document collections found on a website or in a book will usually give you a suggested description or "source citation". Take the suggestion. Let's say the document collection you're using is the 1930 U.S. Federal Census. And let's also say you're accessing it on ancestry.com. Go to the main page of the collection. This is the search screen for the collection. Or, if you find the collection in the website's catalog, it's the link that's in the search results. From this URL, you can search for and find every 1930 census fact and document image in your family tree. That's the basics of source citations! That wasn't so tough, was it? But there's one more thing to do. And it's going to take you longer. Link to your general source, but pack all the specifics into the document image. How many census, ship manifest, draft registration card and birth record images do you have in your family tree? I have about 2,900. Do you want your family tree to be your incredibly valuable legacy? Don't skimp on the details. All your document images need individual, more specific notations. Yes, it's a big task! I devoted time to annotating my 513 census images earlier this year. 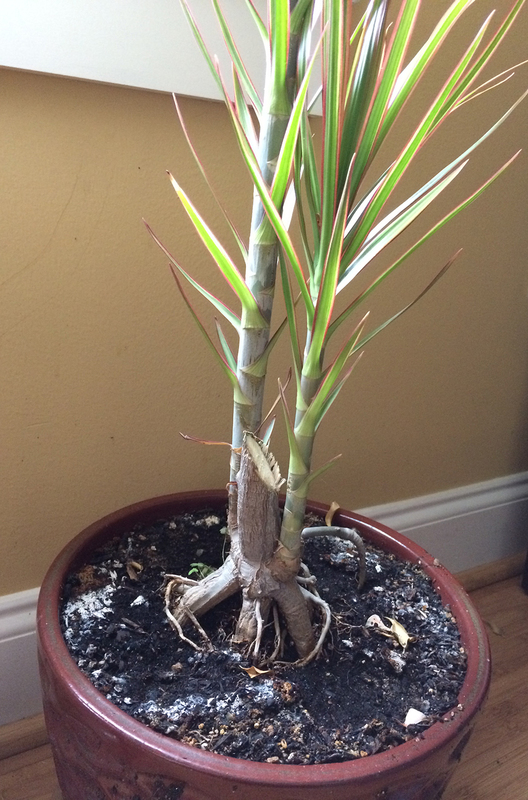 I'm making sure I add all the details each time I add a new document of any kind to my tree. But my next task is to annotate my 337 ship manifest images. Work your way through, one type of document at a time. You'll get there. This level of detail makes my work easy to verify. Even without an ancestry.com subscription, the breadcrumbs are there. You can find the document in another repository. military records, and so on. 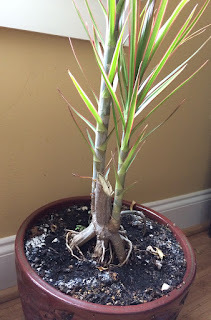 You'll be the envy of every genealogy hobbyist you know! No rubber gloves necessary. Family tree housekeeping uses no rags, cleansers or mops. I don't enjoy cleaning my house. The dog's gonna mess it up in no time anyway. But I will make time for family tree housekeeping. Unlike my house, my beautifully polished family tree will stay pristine forever. Don't you want your family tree to be your legacy? 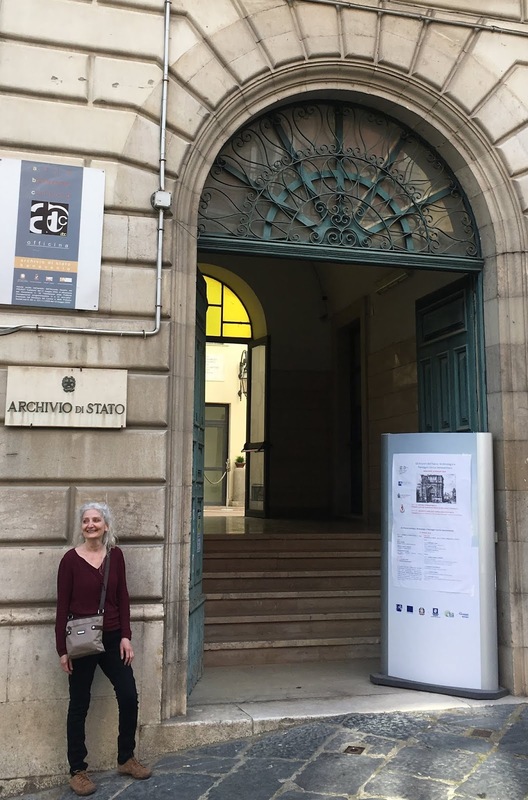 Can you imagine the joy of the relative who inherits your amazing family history research? Most of us jump into this genealogy hobby all excited, grabbing names and documents left and right. We learn more and get more professional about it as we go. But there's a good chance our earlier work doesn't live up to our current standards. Here are 3 important family tree housekeeping tasks you can do while you're watching something boring on TV. 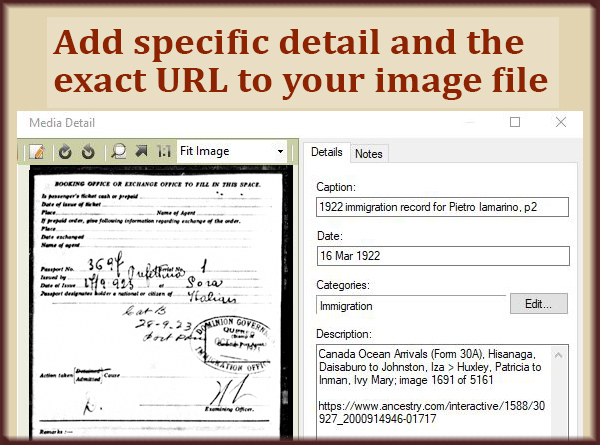 Add facts to each document in your family tree. But you need to go back to those older document images. Add enough facts to allow anyone to retrace your steps and prove you're right. Let's say you add the URL of the document on ancestry.com. What if someone without a subscription needs to know more? What if the URL changes? Add enough detail to help someone find it somewhere else. How many times have you kicked yourself for not writing down where you found a particular fact? Make a habit of creating good, reliable sources each time you add a new type of image to your family tree. All the unsourced facts and images in your tree need your attention. 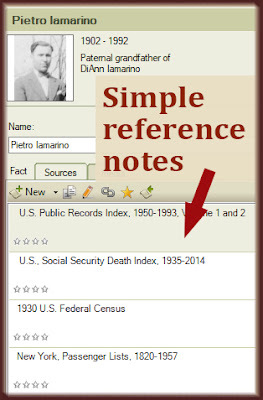 When you find a fact online or in a reference book, look for a description of the document collection. You can copy the citation detail and citation text for the collection from its source. That may be a page on Ancestry.com, FamilySearch.org, or in a book. Add enough facts to your source to make it official and retraceable. There's no need to go overboard. I don't have a separate source for each document or fact, because I would have more than 3,000 sources. I have one source for the 1910 U.S. Federal Census, for example. The source includes the URL to the collection, a description and citation. 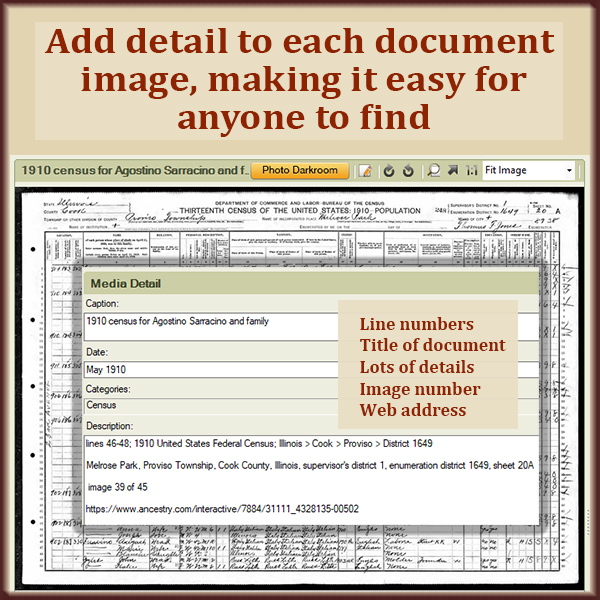 Each 1910 census image includes the URL to that specific page. And each fact taken from a 1910 Census links to the one source. 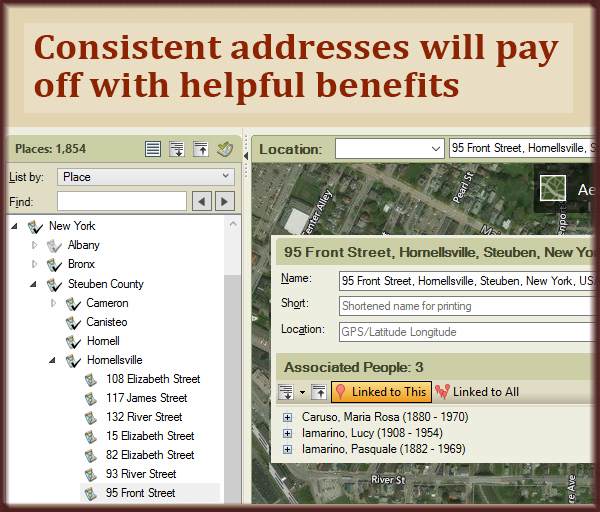 Once I standardized the addresses, my Family Tree Maker software offered me suggestions. I'd type "237" and it would immediately suggest "237 East 149th Street, Bronx, New York, USA". It's a great time-saver. I love it when I start to type an address, and the suggestion shows I've got another relative living there. This orderly arrangement of addresses makes it easy to see which relatives lived near one another. I also like to use my software's ability to locate each address on a map. Every address is neatly arranged. I can drill down by country, state or region, county or province, town and address. For each address, I can see the list of people I've associated with the address. If your tree has only a few thousand people, you might tackle these housekeeping tasks in a weekend. If you've gone wild and have 19,000 people like I do, it's more of a challenge. But set aside time now and then. Chip away at it. You can get this done. In the end, you'll have a high-quality tree that will show genealogy newcomers how it's supposed to be done. How Are Your 2018 Genealogy Goals Coming Along? It's nearly August already! How are you doing with your 2018 genealogy goals? Last December I encouraged you to set some genealogy goals. The point was to help push yourself to work on or finish important genealogy tasks. So how are you progressing? It isn't too late to hack away at those goals. Here's my own list of 2018 goals. Let's look at how I'm doing and see if that can inspire you. Done! But it is ongoing. Each Sunday I consult my list of file types to back up. I've only missed a couple of weeks, but at this very moment, my files are 100% backed up. I back up my files to a neat little external, 1 terabyte Seagate drive and to OneDrive by Microsoft. I get a free terabyte of space there because I subscribe to Microsoft Office Online. When I uploaded my raw DNA to GEDmatch.com, I discovered that my parents are 4th or 5th cousins. Boy, did that leave them with their mouths hanging open. My goal is to find their connection. Somewhere there is a pair of 5th or 6th great grandparents that they share. I haven't found the connection yet, but I am actively working on it. I'm going through the vital records from their ancestors' neighboring hometowns and building out their families. I'll find that connection eventually. I just hope I'll find it while they're still alive to laugh about it. I feel like I talk about this every day. 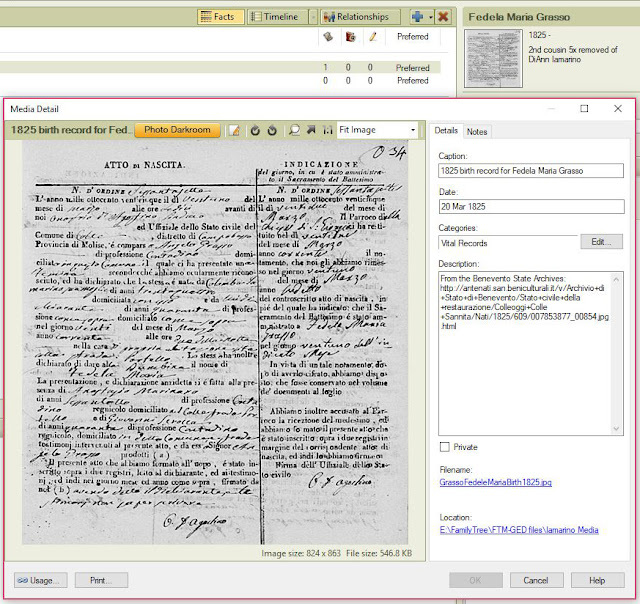 If you don't know or you have no Italian ancestors, Antenati is a website with TONS of Italian vital records. The word antenati means ancestors. I have—easily—several hundred relatives in those records. Sometimes I search the documents for someone in particular. Sometimes I go year by year searching for every baby born to a particular couple. But I really want to record the facts from all the records in a spreadsheet. I've completed several years' worth of records. It makes searching for someone so much easier. A sliver of my ambitious master file of tons of vital records. Someday, when it's all done, I can share the results and benefit everyone else who's a descendant of these towns. So, I'm actively working on it, but I can't finish it in 2018. A near-disaster with my "document tracker" spreadsheet has forced me to make a ton of progress on this goal. Last week I wrote about a screw-up in my master spreadsheet where I keep track of every document image or date I gather for someone in my tree. I took full advantage of a glitch in the file to make progress with my 4th genealogy goal. Line-by-line, I'm examining my document tracker. 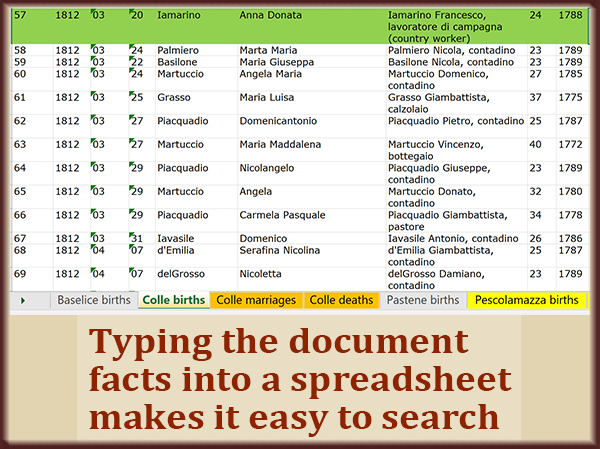 I'm comparing each person's line in the spreadsheet to their documents and facts in Family Tree Maker. I'm filling in all the columns, and determining what's missing. My spreadsheet of everything I've found, and everything I need, guides my research efficiently. I'm adding the missing facts to the "Need to Find" column. Then I give the person's entire row a green background color to make it clear I've examined that person. I'm not following alphabetical order because I'm also working on goal #5. I have completed my review of the letters A through C (that's last names) and S through Z. I've done all my Leone relatives and my Iammucci relatives. Those areas contain some of my closest relatives. I'm making progress and absolutely will complete this in 2018. 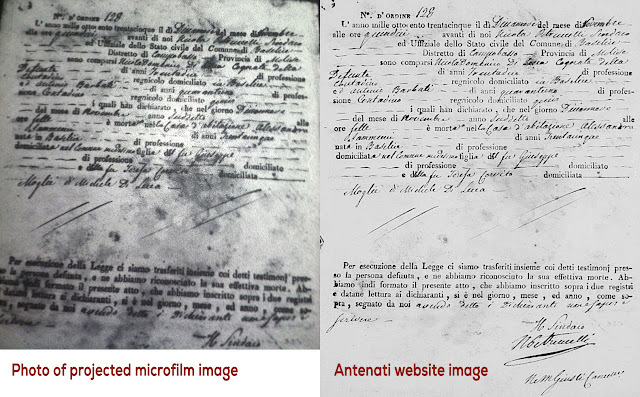 Around 2008, before the Antenati website and FamilySearch.org made the Italian vital records available online, I ordered microfilm of the vital records from my maternal grandfather's hometown. I viewed every record from 1809 to 1860 on nasty old microfilm viewers at Family History Centers in Philadelphia and Poughkeepsie, New York. The Philadelphia Family History Center had one computer that read microfilm. When it was available, I could grab JPEG files of the documents I wanted the most. In Poughkeepsie I had to take iPhone photos of the projected images. Those are awful. They're dark, fuzzy, and show the texture of the surface on which the image is projected. This dramatic before-and-after comparison makes it clear why I need those high-res documents from Antenati. My goal is to replace all the crummy iPhone photos with high-resolution images from the Antenati site. I'm making headway on goals 4 and 5 at the same time by focusing on the families from the town I researched on microfilm. I can replace those bad images, fill in the blanks for those people on my document tracker, and make double the progress. It's August-eve. We're seven twelfths of the way through 2018. That's about 58%. I believe my goals are at least 58% complete. But I'm not taking my foot off the gas pedal. I need to keep on track and keep that finish line in sight. Now it's your turn. And it's not too late in the year to begin! Which genealogy tasks are most important to you this year? How to Make Your Family Tree Fireproof! They probably belong in your family tree, right? Those families with your name, from your town. You have every reason to believe they're related to you. But you haven't found that connecting ancestor yet. So you've got these disconnected families floating in your family tree file. They sit there, waiting for you to find the connection. How easily can you find those families you added long ago, so you can work on finding out more about them? Here's a solution I hope you'll try. people in your family tree at a glance. I've written three times in the past about a software program called Family Tree Analyzer. I was astonished when I discovered this free program. It does exactly what I'd been struggling to write a program to do. But it does it better than I could ever have done. And it does much more than my program ever would have done. Get the latest version of the program at http://ftanalyzer.com (for Windows only at this time). You may need to uninstall the previous version before you can install this one. Here's the feature I want you to look at. 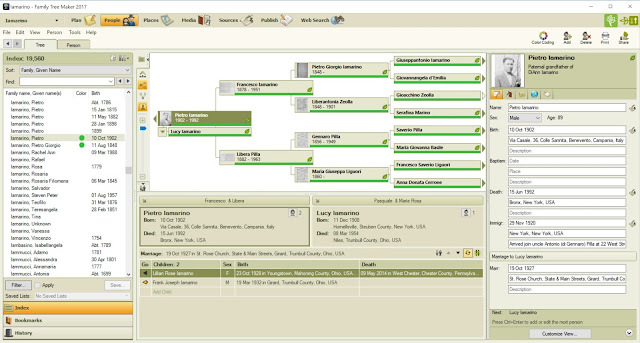 First, export a current GEDCOM file from your family tree software. Then run Family Tree Analyzer and import the GEDCOM. Click the second tab, labelled Individuals, to see a line for every person in your tree. Go all the way over to the Relation column and click it to sort your people by their relation to you. These are the people in your tree who are not attached to you—whether by accident or on purpose. If you can print to a PDF file, go ahead and print this relation-sorted view. You can refer to it again and again, taking advantage of the search function of the PDF file. Don't print to paper! It's going to be a lot of pages. Mine is 1,358 pages. That last number, 4,959 unknown relations, comes as a big shock to me. That's a lot! How many families have I collected on speculation? Further inspection shows me that very distant, convoluted relations are labelled Unknown. That includes father-in-law of cousin of sister-in-law of me. Now you've got the list of unrelated people. Forgive me, but I can't remember where I heard this next tip. I wrote it in a notebook that makes me think I saw it on a YouTube genealogy video. And I subscribe only to Ancestry.com's Crista Cowan, so this tip may belong to her. Here it is: Create a graphic image (or borrow mine from this article) that says something like "No Relation". 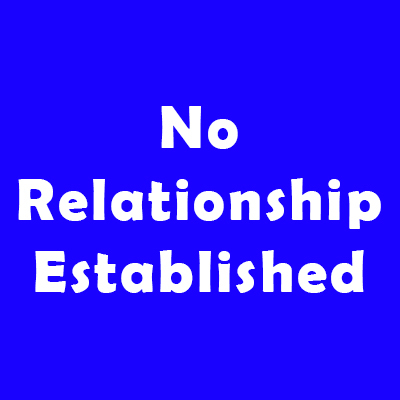 Attach this image to each person on your list of unknown relations from Family Tree Analyzer. Make it their profile picture. Now, the unrelated people will be easily visible. Better yet, in Family Tree Maker I can select an image from my tree's image library and see a list of who it is attached to. The goal now is to focus on these unrelated families. Do the legwork. Find out all you can about them, keeping an eye open for that missing link to you. After some research, you may decide to remove some unrelated people from your family tree. 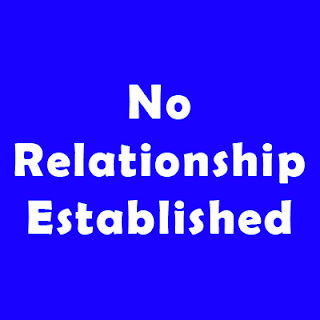 And one day, you may find that your "No Relation" people, are no more!